Cassia angustifolia leaf powder is useful for treatment for constipation & natural laxative as well as dysentery, fever, weight-loss and wounds and ringworms. Cassia angustifolia is native to India and cultivated mainly in India and Pakistan and are mainly known for their excellent healing power and curative properties. We are the Processor, Exporter and Supplier of Senna Leaves, Pods and in Tea cut. Senna is a powerful cathartic used in the treatment of constipation, working through a stimulation of intestinal peristalsis. The leaves were sometimes made into a paste and applied to various skin diseases. It is also used in hypertension and obesity. 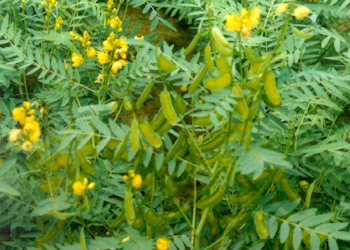 Senna is a strong purgative that should be taken with care and in proper dosage.